Give your guests the opportunity to write down their well wishes in style when they sign your guest book with this perfect pen. 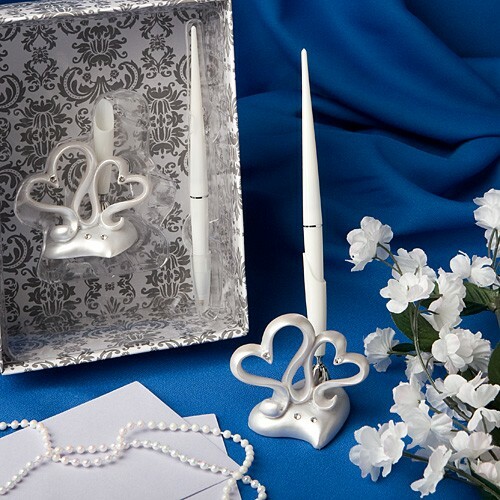 Perfect as a heart themed wedding accessory or to add elegance to any wedding celebration, each interlocking hearts design wedding pen set from Fashioncraft's Finishing Touches Collection of wedding accessories measures 7.25" high with the pen inserted - 3.125" high without the pen - in a 1.75" base. 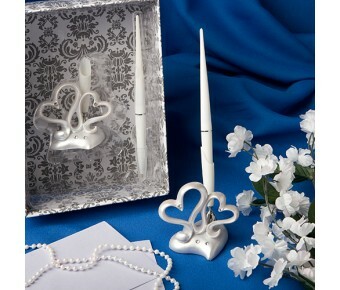 The elegant interlocking hearts shaped statuette base is made of white poly resin with a metal and plastic holder for the white ball point pen. Each elegant pen set comes delightfully packaged in a clear topped box with a slate gray and white damask design base for storage after your wedding day is through.